This model portrays a Tomcat VF-74 'Be-Devilers', a squadron that began transitioning to the F-14 in 1983. The squadron’s distinctive tail marking, a red lightning bolt with a devilish red face and a gun sight superimposed on it, is reproduced in decals by Cartograf. 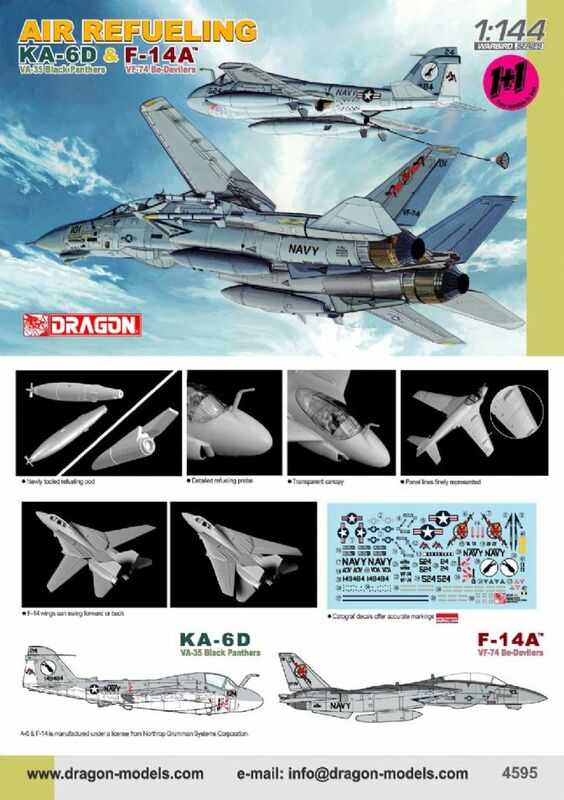 In addition, this kit includes a KA-6 tanker VA-35 'Black Panthers'. It has new features such as a newly tooled refueling pod and Cartograf decals with the Black Panther tail logo. Both aircraft in this set carry the tail code “AA”, and both flew from the USS Saratoga during their tours of duty. The F-14A Tomcat is certainly one of the most well known strike fighters of the US Navy. Equipped with highly advanced twin engines and variable sweep wings, the F-14A can fly at Mach 2.0. Armed with a variety of air-to-air missiles, laser guided bombs and special targeting systems, this aircraft becomes one of the deadliest strikers in the air. In the early 1970s some 78 A-6As and 12 A-6Es were converted for use as tanker aircraft, providing aerial refueling support to other strike aircraft. The DIANE system was removed and an internal refueling system was added, sometimes supplemented by a D-704 refueling pod on the centerline pylon. The KA-6D theoretically could be used in the day/visual bombing role, but it apparently never was, with the standard load-out being four fuel tanks. A few KA-6Ds went to sea with each Intruder squadron, and the retirement of the aircraft left a gap in USN and USMC refueling tanker capability that was only later remedied by the new F/A-18E Super Hornet, which can act as a tanker.